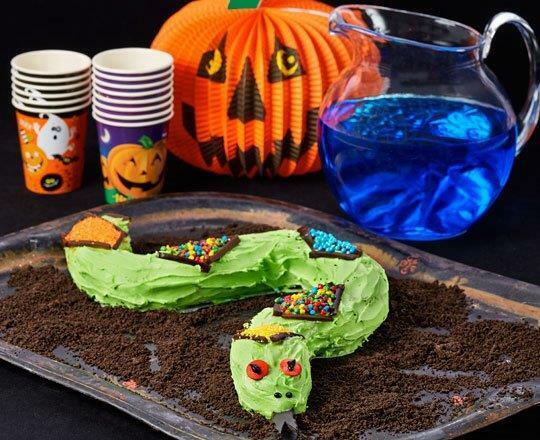 Make the OREO constrictor/python the centrepiece of your Halloween spread. It will be a huge success! COMBINE chocolate and butter in a bowl over simmering water, stirring occasionally, until melted and combined. Remove from the heat and cool slightly. Beat together the PHILLY and icing sugar then beat in the chocolate mixture and food colouring. Set aside ¼ of the mixture for the final coating. Chill all frosting until required. SANDWICH the OREO together with some of the chocolate mixture, standing side by side on a tray or cake board to form the shape of a twisting snake. (Stick together 3 OREO with chocolate frosting and stand at one end of the snake to make the head.) Chill to firm. Thinly cover snake with a coat of the chocolate mixture. Chill for several hours and then do a final coating with reserved frosting. Decorate as desired. Chill again but return to room temperature before serving.